The Bottlebrush is a member of the Callistemon genus, which comes under the umbrella of the Myrtle family. There are some 30 Callistemons and all but four of them are Australian endemic species. The highly appropriate name Callistemon has its origins in the Greek words, kallistos, meaning very beautiful and stema (stamen). It’s a very hardy Australian shrub or small tree that features a magnificent and highly distinctive flower head. Their prolific flowers are adored by nectar loving birds and insects and their ability to survive the harshest gardener neglect makes the Bottlebrush a great choice for almost every garden and landscaping project. However, it is difficult to distinguish many Callistemon from their close relatives the paper barks and honey myrtles of the Melaleuca genus. The difference has traditionally focused on the way the stamens connect to the floral tube but this is now seen as highly ambiguous. 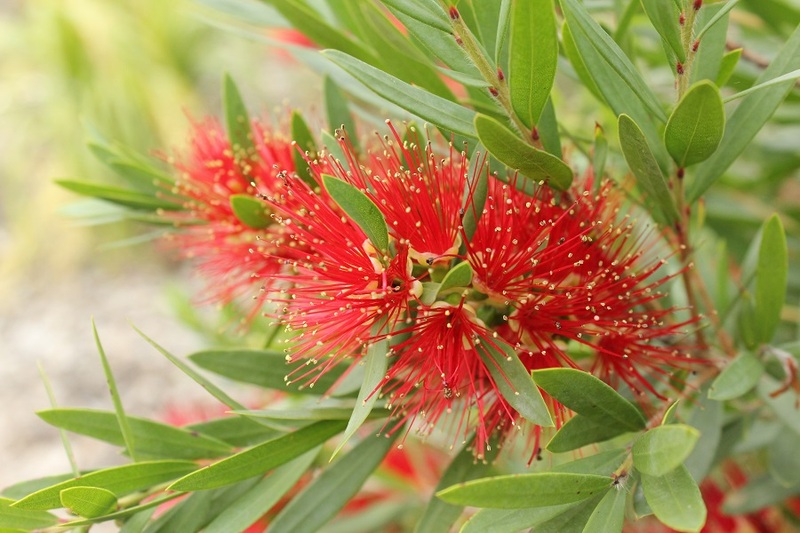 Thus many plant experts now classify the Callistemon as members of the Melaleuca genus. These Australian native plants will thrive in most conditions ranging from damp through to very dry situations and in a wide variety of soils. The enormous variety of flowers, foliage and growth habits across the Bottlebrush family means there is a Bottlebrush for every corner of your garden. Whether you’re looking for a narrow hedge, an ideal specimen tree or an ornamental plant there is a Bottlebrush to suit. 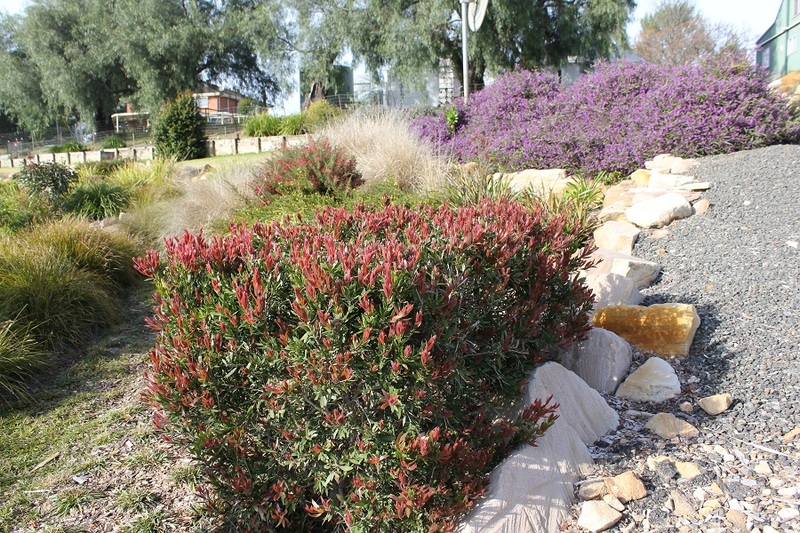 Varieties such as Slim™ Callistemon viminalis are a perfect choice for hedging especially in those tight, narrow spaces. 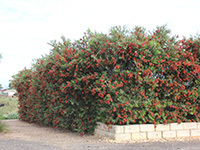 It grows naturally to 3m high x 1.3 m wide but can be pruned down to 1.5m x 60cms. It requires minimal pruning and unlike most Callistemon it will grow branches all the way down to ground level leaving no ugly gaps in your hedge. It produces brilliant red flowers in profusion spring, summer, and even autumn. It is also extremely tolerant (for Callistemon) to frosts. 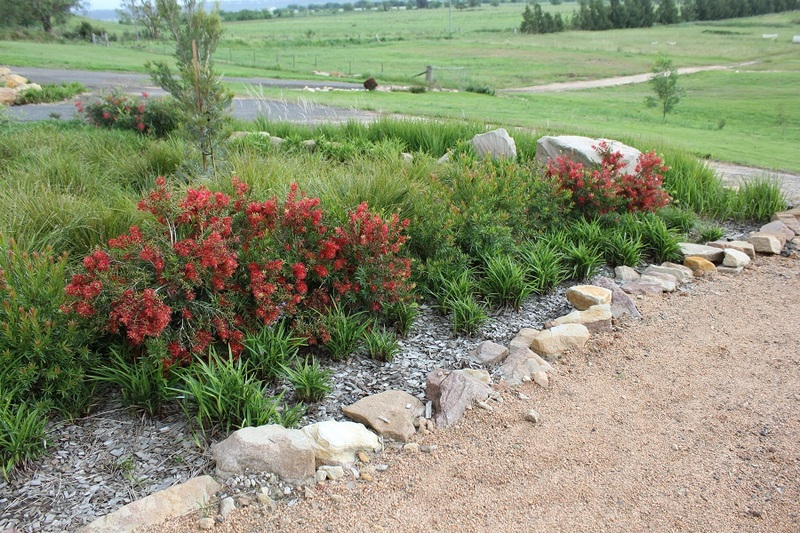 Scarlet Flame™ Callistemon or Better John™ Callistemon work perfectly as small to medium sized shrubs providing high impact flower colour and foliage texture and structure for rockeries, borders or as a specimen ornamental shrub. 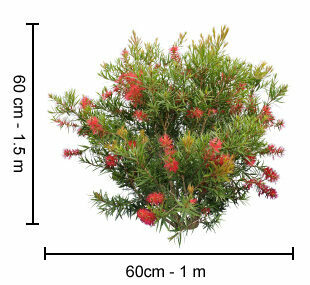 Red Alert™ Callistemon viminalis is another great choice for either hedging or as a specimen shrub. Red Alert is perfect for minimal maintenance gardens as this variety almost never flowers. Instead it produces vivid red new foliage for two months in autumn and again in spring to make a spectacular contrast with the lighter coloured foliage that appears during the rest of the year. 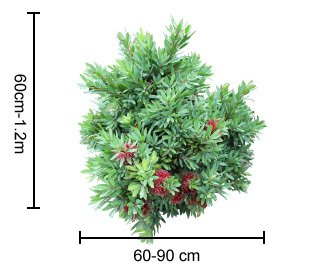 You can allow the Red Alert™ Callistemon to grow to 2-2.4m high x 1.5-2m wide unpruned or prune it down to a more manageable 50cm-2m high x 40cm-1.5m wide. The Little, Better, and Green John varieties make great specimen or contrast plants. 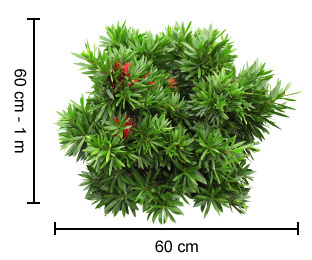 Little John callistemon viminalis is a dwarf callistemon popular for its blue-grey foliage and dark red flowers. However, it can be reluctant to flower. 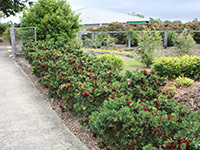 Better John™ Callistemon was developed as an improvement on the Little John. 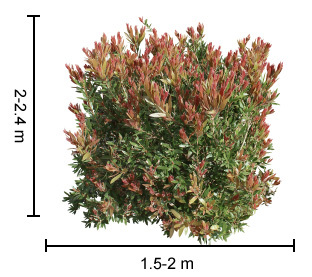 At just 60cm -1.2m high x 60 – 90cm wide it retains the small size of its parent but is easier to grow, faster to get established, and produces more vibrantly coloured blue-green foliage. Its small deep red flowers appear from September to November. 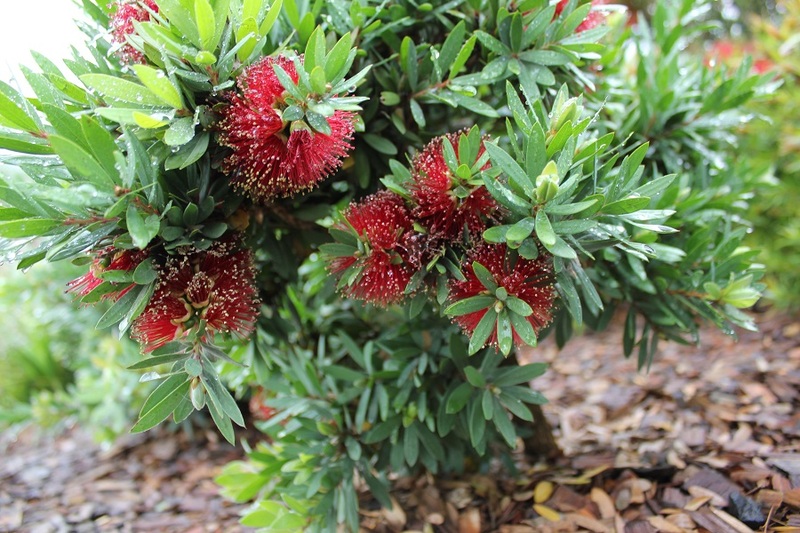 Green John is an exquisite little Bottlebrush that grows no higher than 1m. Its lime green new leaves are longer than those of the Little or Better John but then the foliage matures to a deeper green. Beautifully formed red brush flowers form a nice contrast against the dense foliage. It grows to a maximum of 1 m high x 60 cm wide. The Little, Better, and Green John varieties are very hardy and are generally drought tolerant and moderately frost tolerant as well. These beauties are best planted in full sun to part shade and suit most soil types from sandy to well-drained. The smaller Bottlebrush plants work beautifully in rockeries and in gardens where you need a plant with real shape and colour. 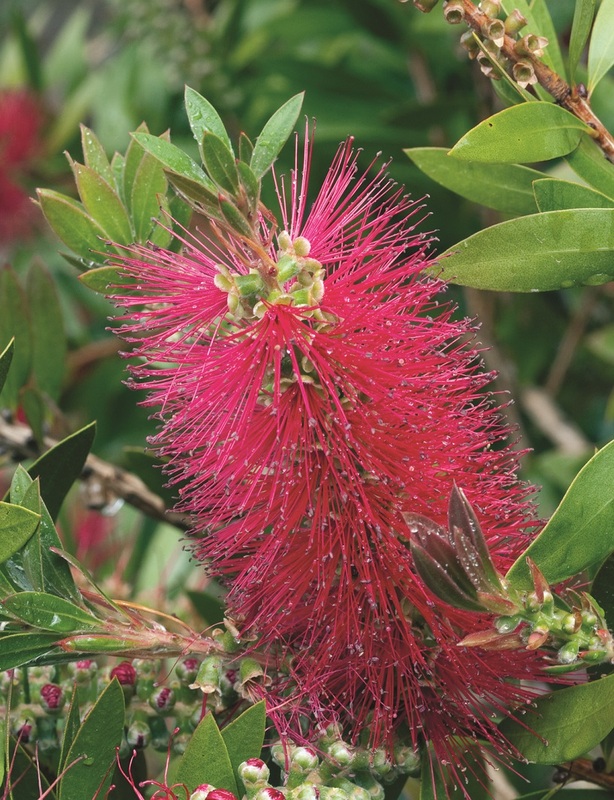 Here too the wide ranging versatility of the Callistemon genus is a real boon for gardeners. Go for small and delicate with the Little, Better, and Green John varieties or Flora Burst™ or create a really solid hedge with some of the slightly larger shrub forms. 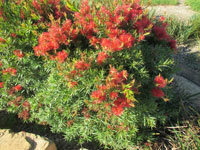 Scarlet Flame™ Callistemon viminalis works beautifully as a dense compact shrub. Leave it alone and it will grow to around 1.5m high x 1m wide or prune it every year to keep it down to around 60cm – 80cm high. Macarthur™ Callistemon viminalis (combining the best of Little John and Captain Cook) is a gorgeous low maintenance shrub growing up to 1.8m high by 1.5 m wide. Pruning will really encourage flowering. Pruning several times a year will produce the optimal results if you’re looking for a tight hedge. 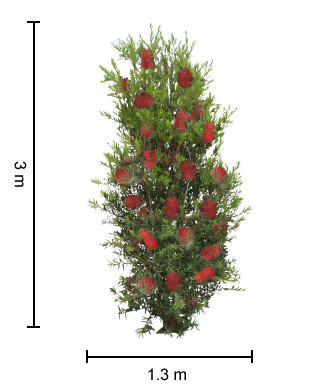 Flora Burst™ Callistemon viminalis will produce a stunning display of beautiful red flowers in spring. It will even repeat flower in the autumn in some parts of the country. The Callistemon viminalis is a very hardy species and will grow in a wide range of soils including heavy waterlogged soil. Its hardiness and vigorous growth have made it a popular parent for many garden hybrids. Callistemon viminalis forms a spectacular tree up to 8m in height. The flower spikes up to 150mm long are spectacular with their bright red stamens. 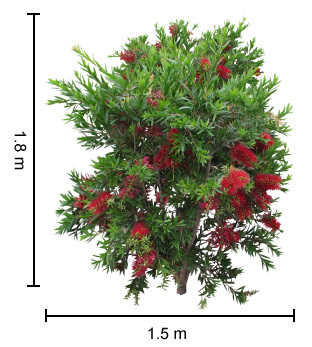 Callistemon ‘Dawson River Weeper’ is a large shrub or small tree growing up to 4 or 5 m tall and 3 or 4 m wide. 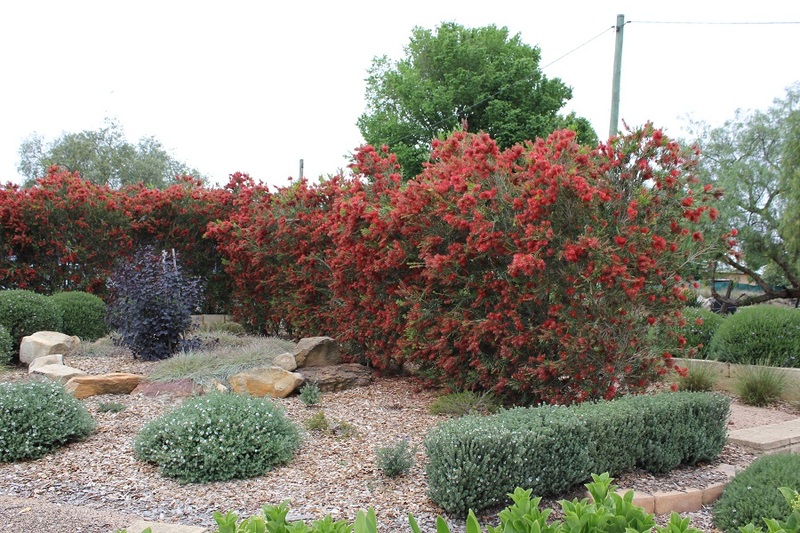 It forms a beautiful dense weeping habit and works well as a screening plant and produces beautiful red flowers during a prolonged flowering season. 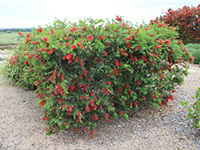 Bottlebrush flowers tend to be more colourful and prolific when the shrub is planted in full sun. Hybrid cultivation has expanded this colour palette enormously. Add to this the variation of foliage colour from plant to plant and across the seasons and you begin to see why the Bottlebrush is such a perennial favourite with gardeners everywhere. Either Callistemon citrinus or Callistemon viminalis serve as one of the parents in most hybrid forms. Bottlebrushes are one of those absolutely brilliant plants that forgetful gardeners love because the plants will tolerate almost any amount of neglect. You can literally love and leave them. They grow in most types of soil but do not cope with very alkaline soils. 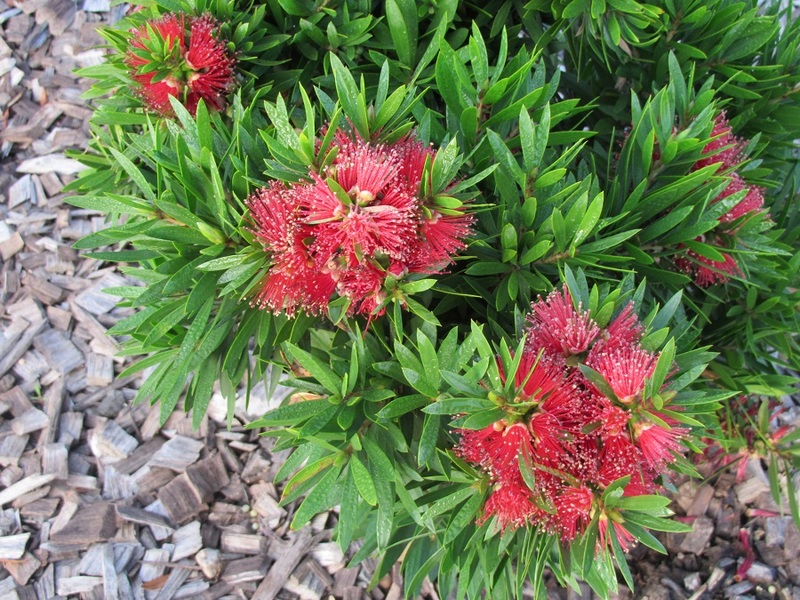 Most Callistemon will cope with heat and drought as well as cold weather and mild frosts but some varieties will not like extremes of dry heat or prolonged heavy frosts. Plant in full sun to partial shade. Plants in full sun generally flower more prolifically and produce more vibrantly coloured flowers. Providing good mulch for the plants will help to keep the soil nicely moist. Apply a good slow release, low phosphorous fertiliser in spring if necessary. Avoid too much nitrogen because nitrogen will foster foliage growth at the expense of flowers. 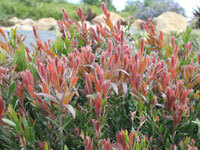 Plant your Callistemon in a warm sunny area if you live a cooler inland zone. 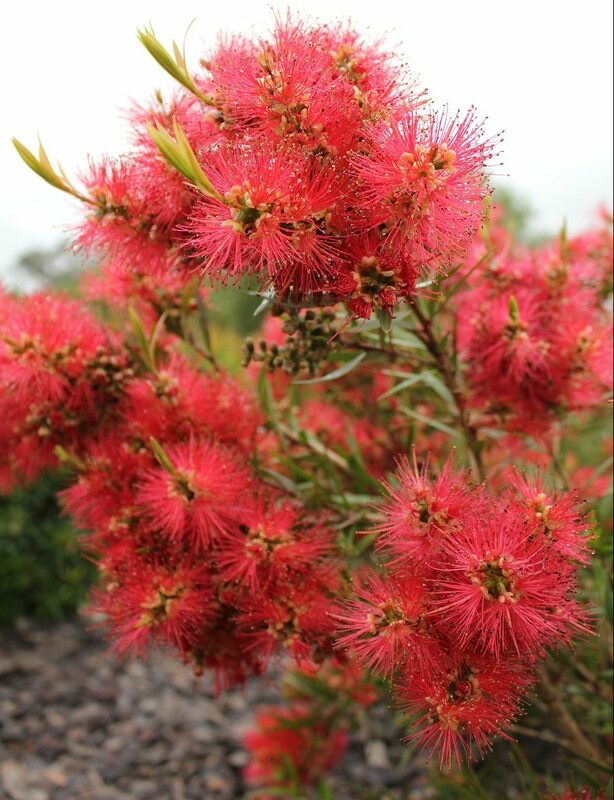 All the Ozbreed Callistemon varieties are highly resistant to Myrtle Rust. A light pruning after flowering will encourage ongoing flowering. Remove flower spikes after they finish flowering. Flora Burst™ Callistemon and Scarlet Flame™ Callistemon have an advantage here in that they self-clean dead flower heads to some extent leaving a cleaner plant overall. Some varieties such as Better John require minimal pruning if any (perhaps every 2 or 3 years). It depends too on the shape you’re looking for. If you want a dense hedge then careful annual pruning is necessary to prevent the plants becoming straggly. Pruning the tips or fresh new growth is helpful for developing the shape of your Bottlebrush. But you don’t want to do this too late in the season because new flower buds will start to form at the end of these young shoots once this growth starts to harden off. If your Bottlebrush is starting to look a little scraggly you can cut it back quite heavily to encourage new growth. The good news is you can usually resurrect even the most untidy looking specimens. And they’re pretty tough plants so you’re unlikely to do too much damage. 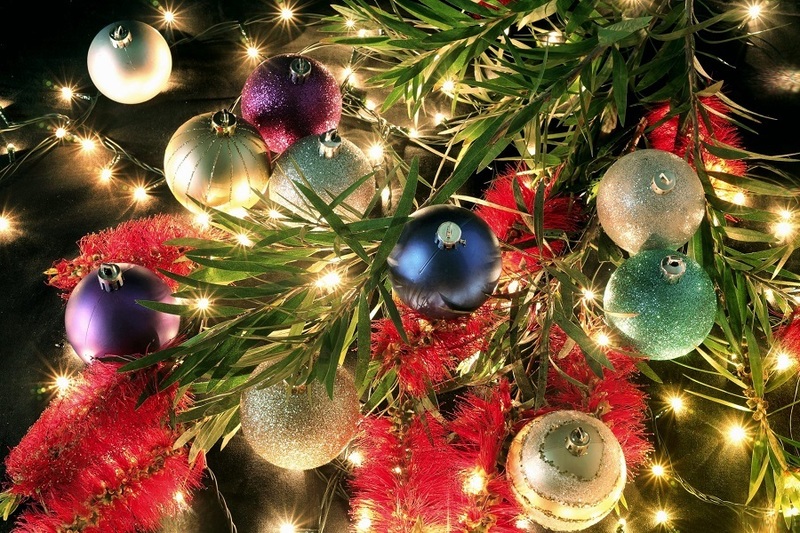 Slim™ Callistemon viminalis with its profusion of flowers through the Christmas period makes for a great Christmas tree. Its stunning red flowers make the most exuberant natural Christmas decorations and its verdant green foliage completes the Christmas tree look. The Bottlebrush flowers with their rich nectar formed a natural source of energy for the Aborigines. The Bottlebrush made such an impression on the early European visitors that Joseph Banks introduced the plants to Britain in 1789. Essential oils made from the Bottle Brush flowers have been used in traditional medicine for treating urinary tract problems, bed wetting, constipation, and as a diuretic. The flowers and leaves may also be used to make coloured dyes. 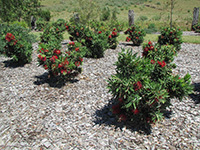 This range of Ozbreed callistemons have been chosen for better performance and looks. They are able to handle harsh conditions including drought while still looking great in the landscape. Click on one of the plants below to find out more.